The Soviets are probably my favorite nationality for creating an Order of Battle for. Over the years I have acquired a great amount of primary Soviet documents which makes the task easier. Starting back in 2001 when I first started research for John Tiller, I purchased a 12 volume set of books from Nafziger Publishing,” Soviet Army Order of Battle in World War II”, by Charles Sharp. These books were cutting edge at the time and help me understand the composition and structure of the Soviet Army. These books had extensive Shtat (TO&E) listings for most units. The volumes focused on the Rifle Divisions broke them down to regiments in most cases, although they had many errors in these breakdowns. These books are strictly for TO&E and subunits information, but they have been supplanted by primary documents we have obtained and explained below. Basic order of battle research should start with the BSSA books (Boyevoy Sostav Sovetskoy Armii – Combat Strength of the Soviet Army). This is a 5 volume set with each volume covering a year of the war (1941 – 1945). These books give a complete listing of units for each Front/Army on the 1st of each month for the year. This is a good starting point for any the various battles we are designing for, and you will at least break down to rifle divisions/brigades, tank/mechanized corps/brigades, artillery corps/regiments/battalions, air corps/divisions, and engineer regiments/battalions. I originally purchased a set of these back in 2002 on microfiche but they are now available online in digital format. Also Nafziger Publishing has these published in English in a 22 volume set. A second set of books that David and I purchased from a contact in Moscow is the BSOA (Boyevoy Sostav Obshchevoyskovykh Armiy – Combat Strength of the Combined Armies). These books cover each army including the commander and chief of staff by dates, and a listing of components of the army on the 1st, 10th and 20th of each month. There are 2 volumes for 1941, 4 volumes for 1942, 6 volumes for 1943, 4 volumes for 1944, and 4 volumes for 1945, for a total of 20 volumes. These can be used in coordination with the BSSA volumes and can show changes during the month to the army’s composition. For the composition of Corps and Brigade units we purchased a number of document books from our Moscow contact over the years. We now have documents covering the tank and mechanized corps, tank and mechanized brigades, cavalry corps and divisions, and rifle divisions. These consist of 41 volumes so far (only 4 out maybe 100 for the rifle divisions) which give the composition of the units on the 1st, 10th and 20th of each month they existed. All of these books also give the commanders, chief of staff by dates, subordination to, combat history, and awards won by the unit. Next is a set of 36 Perechins (Listings) of units in the Operating Army with the dates of active service. As an example, volume 5 covers Rifle, Guards Rifle, Mountain Rifle and Militia rifle units. This book breaks down the divisions into their subcomponents such as rifle regiments, artillery regiment, antitank battalion, recon company, etc., and the dates the unit and subunits were active in the Army. Lastly we have close to 1000 schematics views of Shtats (TO&Es) from the Soviet archives we are now using for unit composition data. 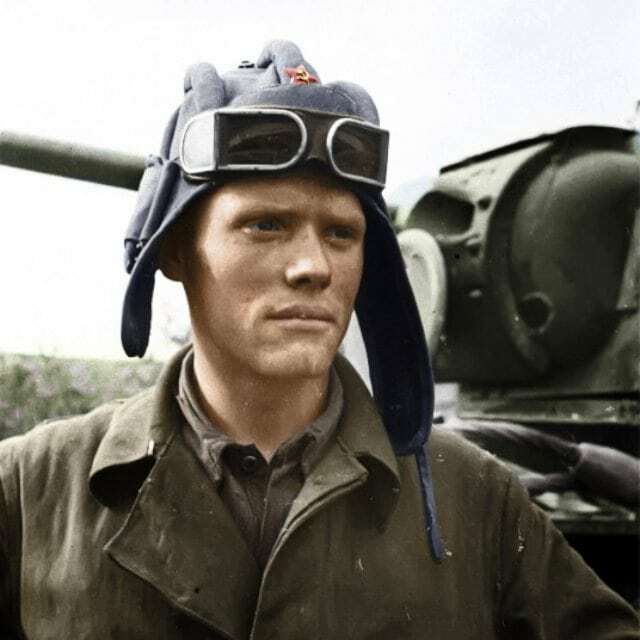 In addition, I have a few hundred gigs of primary Soviet documents for various Fronts and Armies throughout the war we can use for things such as strengths and to verify composition of army’s. As you can see, most of the material we use to create a Soviet OOB is in Russian and usually primary documents. We will show pages from these documents as we create our Soviet order of battle. For our example of a Soviet OOB, I will use the sample hypothetical game on the battles near Budapest in January 1945. I will use the same book, “The Sword Behind the Shield” as the basis for our game OOB. The Soviet Front opposite the German front lines for the Konrad battles was the 3rd Ukrainian Front, commanded by General F.I. Tolbukhin. The Army opposite the German forces slated to attack was the 4th Guards Army, commanded by General G.F. Zakharov. We know that the date of the start of Operation Konrad I was 1 January, 1945. We start to create the overall Soviet OOB by looking at the BSSA volumes. Since the BSSA shows the entire Fronts units on the 1st of each month we need to consult the January 1945 listing. Below you will see the 2 pages listing the 3rd Ukrainian Front for 1 January 1945 (pages 24 and 25). The BSSA is divided into 7 columns. On page 24 I have highlight some units. In the first column, it calls out the 3rd Ukrainian Front, and under the front, the 4th Guards Army. In the second column, I have highlighted the 31st Guard Rifle Corps consisting of the 4th, 34th, and 80th Guards Rifle Division. The abbreviations гв ск stand for Guards Rifle Corps, while the гв сд stands for Guards Rifle Division. I have highlighted these units as we are going to be using the 80th Guards Rifle Division as one of our example OOB units. 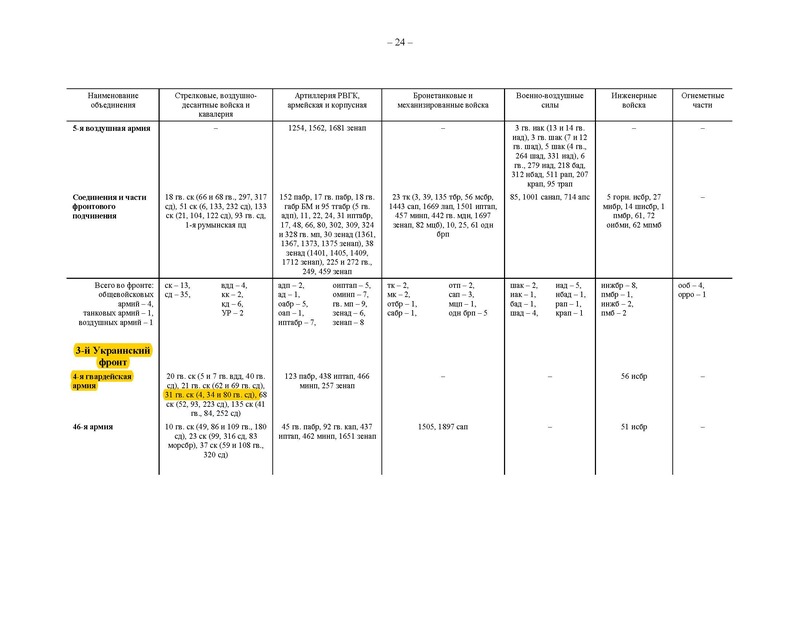 On page 25 in the 1st column, I have highlighted the reserve forces of the Front. As you can see in columns 3 and 4 most of the Fronts artillery and tank/mechanized units are under front control to be parceled out the varies armies as needed. In column 3, I have highlighted the 9th Breakthrough Artillery Division, consisting of the 26th Light Artillery Brigade, 30th and 115th Gun Artillery Brigade, 23rd Howitzer Artillery Brigade, and the 10th Mortar Brigade. 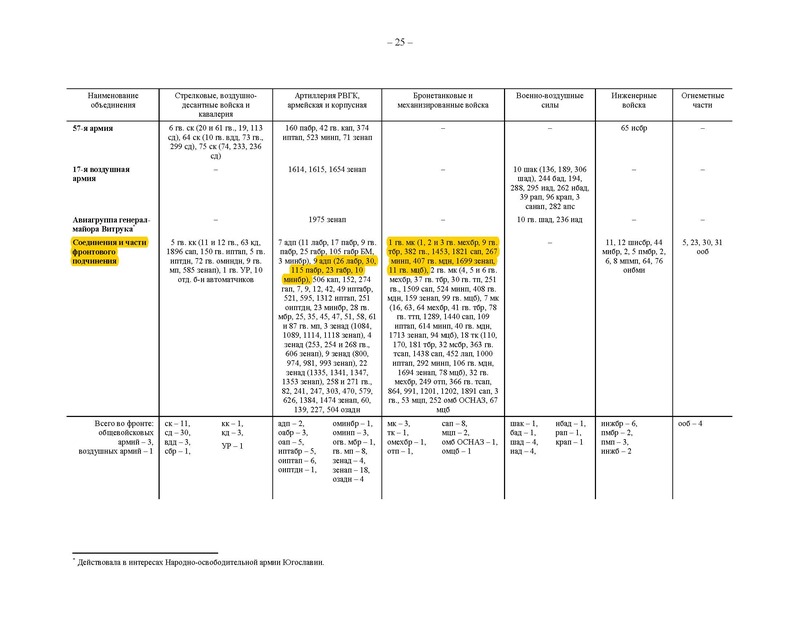 In column 4, I have highlighted the 1st Guards Mechanized Corps, consisting of the 1st, 2nd, and 3rd Mechanized Brigades, the 9th Guards Tank Brigade, 382nd Guards, 1453rd, and 1821st Self-propelled Artillery Regiments, 267th Mortar Regiment, 407th Guards Mortar Battalion, 1699th Anti-Aircraft Artillery Regiment, and the 11th Guards Motorcycle Battalion. You can look at the various abbreviations to get the feel of translating these units to English. Once you know the abbreviation it is easy to start picking out each unit type. Now we will look at a sample page from the BSOA book, 1945 volume 4, showing the 4th Guards Army for 1st and 10th of January 1945. 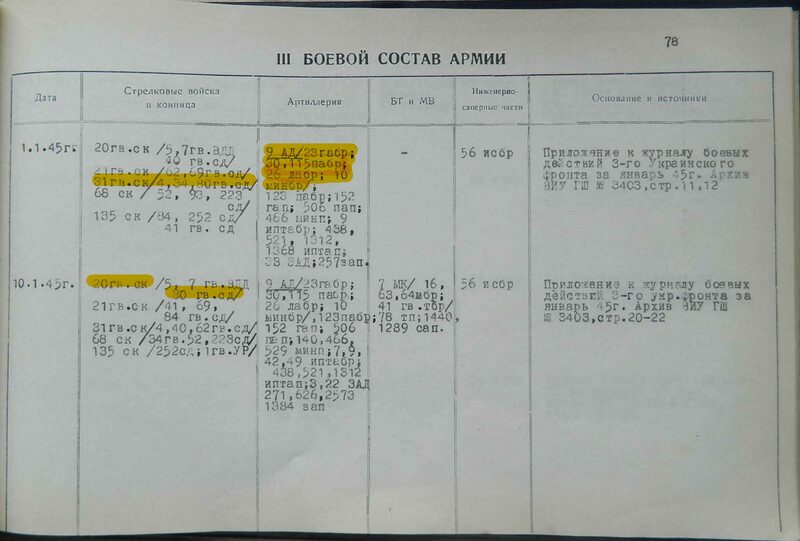 I have highlighted the 31st Guards Rifle Corps in column 2, while in column 3, we see that, according to the BSOA, the 9th Breakthrough Artillery Division has been assigned to the 4th Guards Army. Also under the 10th of January we can see that the 80th Guards Rifle Division has been transferred to the 20th Guards Rifle Corps. Using the BSSA and cross referencing with the BSOA, I can create the basic OOB with all the Front and Army units needed for our game. In the next blog we will look at creating the detailed OOB for the 80th Guards Rifle Division.